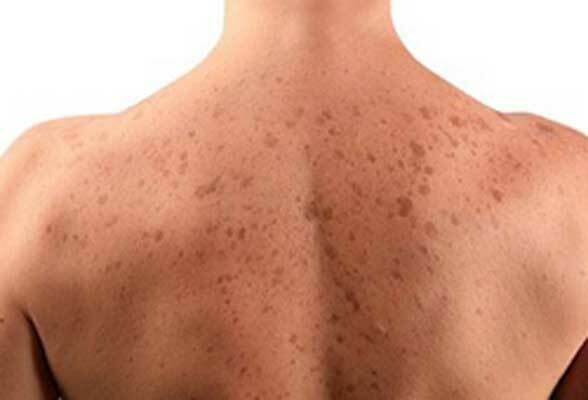 Freckles: These are small, flat round lesions, which occur in the lighter skin types. They tend to turn darker in summer and lighter in winter. Causative factors are genetics and sun exposure. Treatment: Various peels like glycolic and TCA help in lightening freckles. For more stubborn variety light systems like the IPL and lasers like the Q switched NdYag and KTP can be used. Minimal sun exposure, sunscreen and skin brightening and lightening cosmeceuticals will help to keep the pigment at bay. Solar Lentigines: These are flat pigmented 1to 3cm lesions present mainly on sun exposed areas. They start to appear in the third decade of life. Treatment: Everyday use of sunscreen is an absolute must. TCA peels, Intense Pulsed Light systems and lasers such as KTP and Q Switched NdYag can remove them completely. Melasma: Is a stubborn pigmentation seen mainly in women. Occasionally, men too get affected by this condition. It is characterized by a patchy tan or brown discoloration that occurs over the upper lip, cheeks, forehead, chin and bridge of the nose. The areas affected are bilateral and frequently symmetrical. The majority of cases are due to sun exposure, hormonal changes such as pregnancy, menopause, oral contraceptive pills and familial predisposition. Treatment: Melasma is a stubborn condition and requires multiple sessions of treatments. Often 2 or more treatments are combined to give better results. Epidermal melasma (superficial) responds better and faster to treatment. Sunscreens form the most essential part of treatment of melasma. A variety of depigmenting agents such as Hydroquinone, Kojic acid, Glycolic acid, Retinoic acid etc can aid in the treatment of melasma. In addition to this, superficial peels such as Glycolic acid peels and Salicylic acid peels; moderately deep peels such as 50% glycolic acid and TCA, as well as deeper peels such as Cosmelan can be used to treat melasma. Lasers such as Q switched NdYag show limited results. Light systems like the IPL, as well as Microdermabrasion, Mesotherapy has also been successful in treating melasma depending upon the depth and intensity of pigment. Once the pigmentation has cleared, a maintenance treatment with sunscreens and skin lightening products must be continued to prevent recurrences. Maintenance treatments once in two or three months are advised in stubborn cases of Melasma. Post-inflammatory hyperpigmentation (PIH): This occurs following any kind of mechanical, physical, chemical trauma. An acute or chronic inflammatory process like acne, psoriasis, drugs, cosmetics, friction, too can cause PIH. Following trauma, the pigment producing cells produce excess melanin pigment as a part of the healing process. Treatment: Glycolic Acid Peels, Meso Therapy, Cosmelan Peel, Light Systems such as IPL, lasers like the Q Switched NdYag can treat PIH successfully. Minimal sun exposure is advised. Sunscreens with SPF 30 daily and skin lightening Cosmeceuticals can be used to treat PIH effectively. Besides these common conditions, there are various dermatological disorders and systemic conditions including drugs and medications, which may lead to pigmentation. This condition can occur both in men and women. The pigmentation occurs due to frequent and repeated contact with small amounts of sensitizing allergens primarily present in cosmetic and textile materials. It is characterized by a diffuse to reticulated (lace like) pattern of hyper pigmentation and its colour may vary from slate gray, gray brown to blue brown. The sites of Pigmented Contact Dermatitis depends on the allergen responsible and in case of cosmetics, it frequently involves the face and neck. Another common area is the underarms. This condition occurs with musk containing fragrances, medications like antidiabetic medications, and certain antibiotics; Photodynamic substances in cosmetics on exposure to sunlight leave behind a reticulated pigmentation. Avoidance of the incriminating agents and lightening agents and procedures are part of the treatment plan. This is a pigmentary disorder commonly seen in India. It involves mainly the face, neck, and upper limbs but can be more widespread. The pigmentation varies from slate gray to brownish black. It can be diffused or reticulate in pattern. This is a rather difficult condition to treat and it may take years for the pigment to fade. This kind of pigmentation is very common in Indians. It usually involves both the arms and the back. The common causes of this pigmentation are friction, hot showers, and use of loofah and bathing brushes. The pigmentation is usually brownish black with reticulate pattern. All these conditions require a medical evaluation. Strict use of sunscreen and avoidance of triggering factors is the mainstay of treatment followed by applications of various skin lightening products and pigmentation treatments. How are these growths removed? Fortunately these growths are quite superficial and can be safely removed as an outpatient procedure with radio surgery. Topical anaesthetic (numbing cream) is applied 30-60 minutes before the procedure. The skin usually takes about a week to recover.